Deontay Wilder just has to "add his signature" to a contract to fight Anthony Joshua on 13 April, says Matchroom Sport chief Barry Hearn. IBF, WBA and WBO world heavyweight champion Joshua has agreed to defend his titles against Alexander Povetkin at Wembley Stadium on 22 September. Joshua, 28, is contracted to fight at Wembley in April, but no deal has been reached with WBC title-holder Wilder. "Wilder has to ask: 'Do I really believe I can beat him?'" said Hearn. Hearn, whose son Eddie promotes Joshua, added: "Wilder's making a few million dollars a fight. "So does he roll the dice or negotiate over a few million dollars? Joshua has signed the contract, all Wilder has to do is add his signature and 13 April at Wembley is done." All of Joshua's titles will be on the line when he meets 38-year-old Povetkin, who has 34 wins from 35 fights. Wilder aired his frustrations when negotiations to face Joshua in September were unsuccessful, and his team say the 32-year-old will not sign for April if "below-market terms" continue to be offered. Hearn admits the drawn-out negotiations increase the risk of either man being beaten in the interim, but insists he sees no rush as the long-term plan is to make Joshua "a billionaire, not a millionaire". Hearn added: "I think it will happen quite soon. Probably sooner than I would like. I'd like it in two years when they are both huge and we are talking about a billion dollars income, and not $100m income." It's getting a bit tedious, the negotiating. Barry Hearn has hit the nail on the head - this is a new age. Don't talk percentages. Joshua delivers about 99% of it as he will sell out easily. It's about time some people gave themselves a shake. I think Povetkin is the toughest test Anthony Joshua has ever had. As much as the Wladimir Klitschko win was an incredible evening at Wembley, Klitschko hadn't fought for so long. This guy Povetkin, I don't like him as an Anthony Joshua opponent. I think he could ruin everything. 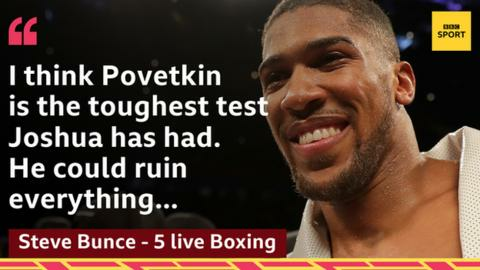 We have been saying avoid Povetkin for a year or more. He is the dangerman in this division. Forget his age, he's fresh and dangerous. I have no reason to hype this fight but I really think this is a dangerous fight.